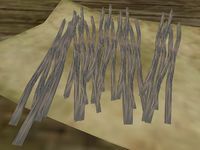 "Saltrice is another of the tasty and nutritious foodstuffs with modest magical properties raised as export crops by Morrowind's farmers and plantation owners. Most saltrice seen in the Empire comes from southeastern Morrowind, but there are also some new and prospering farms and plantations in the Ascadian Isles. Saltrice also grows wild in the Grazelands and on Azura's Coast." 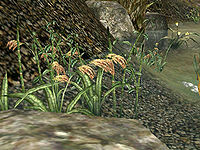 Saltrice is a very common ingredient which grows near water all along Vvardenfell's shores. It is also frequently seen as a food item in people's houses and in taverns and inns. Large quantities can easily be found in sacks, barrels, and crates in food larders everywhere. Saltrice is a very useful ingredient in home-made Potions of Restore Health and Fatigue. This page was last modified on 8 March 2016, at 09:42.